Inte:Ligand supports scientists worldwide with innovative approaches for early drug discovery research using computer-aided design solutions. Molecular designers in the pharmaceutical, cosmetic, and other life science industries use our solutions to design and identify novel bioactive molecules. We develop the most innovative and user friendly modeling software platforms and provide expert consulting to inspire the innovative process of designing molecules, filtering ideas, and de-risking candidates. 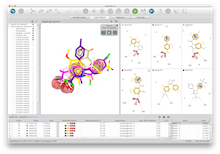 LigandScout, the most user friendly molecular design software suite, seamlessly integrates our advanced pharmacophore and VS technologies with molecular docking tools to create an inspiring and productive experience for multidisciplinary teams. By providing excellent prediction quality with unprecedented speed, LigandScout successfully addresses challenges in interactive molecular design. Register and get LigandScout now!